Solar and wind power are increasingly cost-competitive with conventional forms of electrical power, including coal and nuclear, even without subsidies, according to a new study. “The economics of alternative energy have changed dramatically in the last decade,” said George Bilicic, global head of the power energy and infrastructure group at Lazard Ltd. and author of the report. Solar energy: Is it commercially viable in Canada? The cost for utilities to generate energy from photovoltaic technologies has fallen by nearly 20 per cent in the past year, and nearly 80 per cent in the last five years, he said. 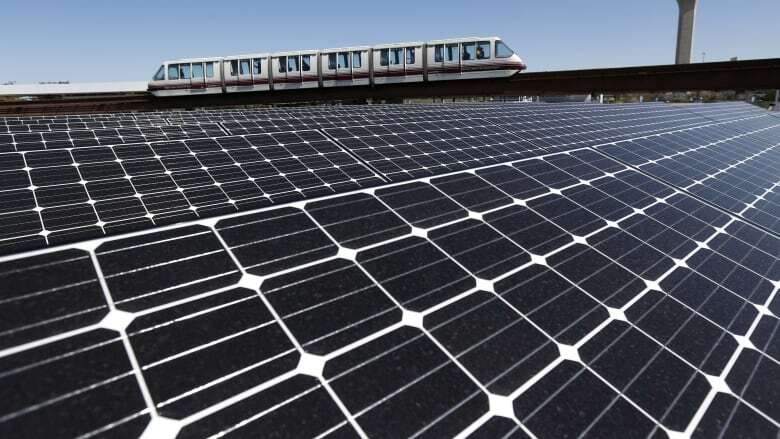 China's entry into the solar panel business has helped push down the cost of solar technologies. As a source of peak energy — that is, power at times when there is the greatest demand on the electrical grid — photovoltaics are more flexible and cost-competitive than conventional technologies, Bilicic said. "What’s most interesting about renewable and the mature area right now is utility-scale wind on land and utility-scale solar on land. That is the most financeable and the most cost-effective," he said in an interview with CBC's The Exchange with Amanda Lang. Lazard has published the study, called Levelized Cost of Energy Analysis, since 2008 and has a perspective on the fall prices. It found land-based wind power has dropped in price — as much as 60 per cent in the last five years, though off-shore power remains expensive. But it questioned the value of subsidies for homeowners who put solar panels on their roof, saying such subsidies may be distorting the energy planning process. "Relative to utility scale renewable, it’s a high-cost product and folks who are attempting to advance it are attaching significance to distributor-owned generation which is a high-cost product," Bilicic said. Without subsidies residential-scale solar photovoltaic solar panels remain considerably more expensive than utility-scale solar, he said. At the same time, large-scale conventional generation projects continue to face a number of challenges, including high upfront capital costs, especially for nuclear. The future of renewables depends on government policy in the area, Bilicic said. President Barack Obama has to determine if he will allow subsidies for renewables to replace coal. However, large-scale generation is still more manageable and cost-competitive for base-load generation, Bilicic said. He believes natural gas power generation will be a transition source, between coal or nuclear and renewables, as gas prices are low because of the U.S. shale gas boom.